When we strip away what is superficial, cultural or traditional, what is the essence of true Christianity? What qualities and beliefs characterize a living-and life-changing-faith? The three letters of John help to answer these questions. 1, 2 and 3 John focus on the most important aspects of Christian life. As Ron Blankley leads you through the lessons of these letters, you'll discover what really matters-now and for eternity. Now available in IVP's revised LifeGuide Bible Study format, John's Letters features questions for starting group discussions and for personal reflection, as well as a new "Now or Later" section following each session. PDF download with a single-user license; available from InterVarsity Press and other resellers. 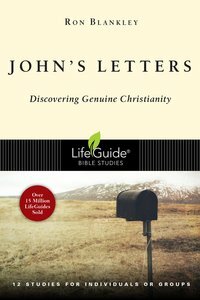 About "John's Letters (Lifeguide Bible Study Series)"